News - What's the best garage or carport for your electric car? If you’re planning to buy an electric car, you may be concerned that you won’t have a good space to park it and charge it. A VersaTube structure is the perfect solution for you! 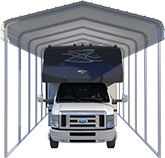 But which should you go with, a carport or garage? To be perfectly frank, for charging safety it’s not a requirement that you have dedicated or covered parking. As long as you have access to the correctly sized outlet for your charging needs, you’re good to go. It’s completely safe to charge in the open. Manufacturers build multiple layers of protection into both the plug and the charging technology on electric cars, making them waterproof, so you won’t have to worry about plugging in, even during snow or rain. But there are plenty of reasons you might want to protect your car and your charging equipment with a VersaTube garage or carport. You’ve just bought a new car and you want to maintain its condition for years! This is a major reason why purchasing a VersaTube Carport or Garage a great idea. Sun, snow, ice, and hail do a number on your car’s exterior, and the best way to prevent that wear and tear is by parking in a carport or garage. Sure, you can park and charge your electric vehicle outside, but do you want to? That means parking within close range of your home and running the plug to an outlet on your porch or deck. Or, for a longer charge, you’ll want to install a 240-volt Level 2 EVSE charger, which would need to go on the side of your house if you don’t have a garage or carport. If you don’t have a garage, this can work, but, let’s be real. Standing in snow, freezing rain, or a thunderstorm to plug in your car, while safe, doesn’t sound like a good time. 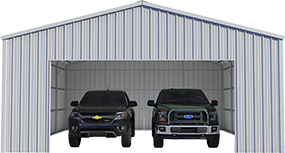 Whether you choose a VersaTube Garage or Carport, you can have electricity run to either option, and either choice will make your daily parking and charging experience a lot more comfortable! Instead of scraping ice off your window or letting the sun slowly crack your leather seats, why not build that garage or carport you really want? 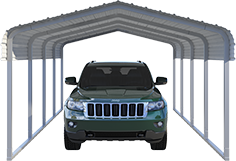 Grab a friend and you can assemble a carport in a single day! Building a VersaTube garage doesn’t take much longer. Or, use our Design Your Own Tool to completely customize a design that’s perfect for you. Spring showers got you down? Stay dry with a walkway cover! Should you put windows in your VersaTube garage?